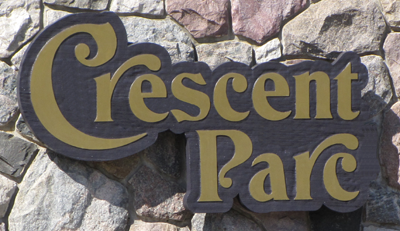 The content of crescentridgeparc.com (“Web site”) is for general information purposes only. This Web site, the homeowners’ association, any associated company or any person related to or involved therewith (Association): (a) assumes no responsibility for the information, content, and any services or products (Material) on this Website; (b) expressly disclaims all liability or responsibility in connection with such Material, including but not limited to any liability or claim for errors, inaccuracies, omissions, or misleading or defamatory statements; and (c) makes no warranties, express or implied, to the extent permitted by law, including but not limited to warranties of satisfactory quality, merchantability, or fitness for a particular purpose, with respect to such Material. Any reference whatsoever within this Web site, directly or indirectly, to any commercial or non-commercial product, process, or service, or link to another site or business by trade name, trademark, manufacturer, or otherwise does not constitute or imply an endorsement, advice or recommendation, approval, sponsorship, affiliation with, or favoring by the Web site or Association. Any links from or to external, or third party Web sites, are provided solely for members or visitors' convenience. Links taken to other sites are done so at your own risk and the Web site or Association accepts no liability for any linked sites or their content. When you access an external Web site, keep in mind that this Web site or the Association has no control over its content. It is important for users to take necessary precautions, especially to ensure appropriate safety from privacy intrusions, viruses, worms, Trojan horses and other potentially destructive items. This Web site might include opinions or views which, unless expressly stated otherwise, are not necessarily those of the Web site or Association. All Web site information, content, format, etc. might be changed or updated without notice.